To start, an introduction. My name’s Meg, I’m a writer, a farmer, a gardener, a joker, a midnight … I’m the new cannabis columnist. Massachusetts is in the middle of its cannabis revolution and I don’t want you to miss a thing. With a new author comes a new perspective for O, Cannabis! I’m interested in your businesses, your growing techniques, and your medical uses. My hope is that this column will continue to be a hub for information and discussion as recreational marijuana becomes legalized in Massachusetts. Under current Massachusetts law, it is legal to posses up to one ounce of recreational marijuana and to grow up to six marijuana plants for personal use. While it is currently legal for state-licensed dispensaries to sell medical marijuana, it will not be legal to retail recreational marijuana until July 2018. Luckily, there seems to be a nearly endless supply of medical marijuana uses. Topical cannabis is becoming a popular product because it does not have any psychotropic effects, meaning it does not change a person’s mental state. Cannabis products that don’t make you high are appealing to a lot of people who don’t like the euphoria, inhibited motor control, and disorientation associated with the drug when ingested. They are also appealing to people with chronic pain who are not interested in opiates. I feel like there are so many people in my life who don’t have an effective solution for chronic pain. At the doctor’s office, medical professionals seem to be quick to recommend steroids or narcotics to address chronic pain and inflammation needs. My partner is a musician who suffers from a repetitive motion injury in his hand and wrist and his doctor offered him Codeine as a solution. Topical cannabis could be worth exploring for his injury because he doesn’t just need a way to mask the pain; he also needs help preventing the injury to begin with. But how does topical cannabis work? Let’s start with the basics. Cannabis sativa is the name of a plant whose buds and leaves are dried into the product marijuana. The active ingredients in those buds are called cannabinoids, and while there are over 100 known cannabinoids in the cannabis plant most people are only familiar with two: THC (delta-9-tetrahydrocannabinol) and CBD (cannabidiol). Topical cannabis products can be made with any of these cannabinoids, but they will not make you feel “high” because the cannabinoids never reach the bloodstream. The first recorded medical use of marijuana was back almost five thousand years ago by the Chinese emperor Shen-Nung, who used the drug to treat the pain associated with rheumatism and gout. People still use marijuana to treat similar pain today. Lisa Burke is team leader at New England Treatment Access’ (NETA) Brookline dispensary and uses NETA’s topical cannabis lotions, called Allay, regularly. Burke said that she had chronic pain for almost a decade, including lower back pain, neck pain from a car accident, and nerve problems that were diagnosed as an autoimmune disease. She said that for almost eight years she would take up to eight Advil a day to alleviate pain, but since using a topical cannabis lotion, her pain is far more manageable. For Burke, the lotion is a great solution for her chronic pain because she can use a little bit before work. She said that it provides immediate relief, and that it has helped her symptoms to weaken over time so she no longer needs to use the product everyday. NETA has a second medical marijuana dispensary in Northampton where their product Allay is available for those with a medical marijuana card. Norton Arbelaez, the Director of Government Affairs at NETA, said that NETA does not make medical recommendations, but simply makes and distributes their own products. He said that their cannabis lotions are effective because of their unique combination of cannabinoids and other plant extracts, including arnica. After the lotion is applied, the cannabinoids interact with the body through the skin. From there, they bind to the body’s own network of cannabinoid receptors that are part of a vast system of neurotransmitters (called the endocannabinoid system) that regulates several physical and cognitive processes, including fertility, pregnancy, appetite, and pain-sensation. Topical cannabis products work by combining different cannabinoids to achieve different ends, including treating pain and reducing inflammation. Burke said anecdotally that she has an older patient with arthritis who has found that topical cannabis is very effective at reducing her pain. “It’s a great opportunity for people who have pain and are afraid of cannabis to come in and start slowly,” Burke said. Until recreational marijuana is legal, getting access to these processed cannabis products at medical facilities like NETA can be difficult. There are similar products available containing CBD, which is a cannabinoid derived from hemp that is non-intoxicating and less regulated. 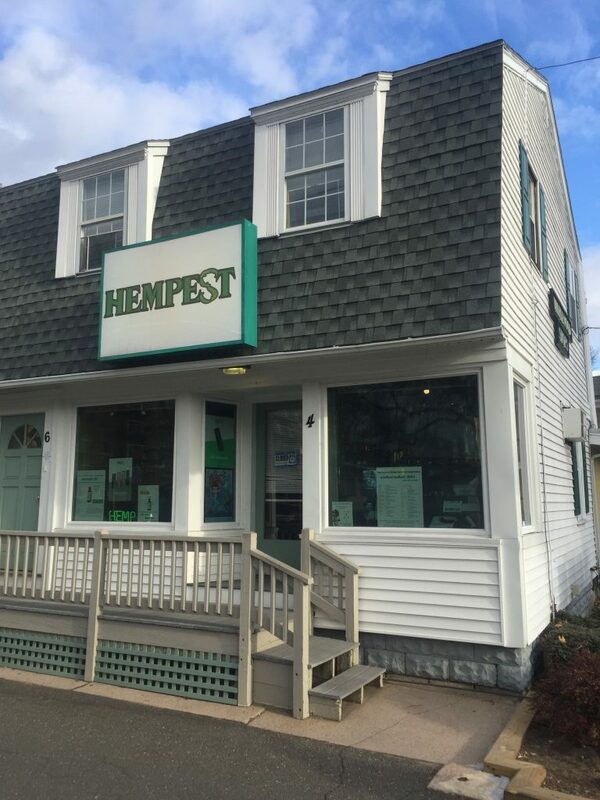 At the Hempest in Northampton, manager Steve Leone said that he uses a combination of topical and internal CBD products to alleviate pain. “I wasn’t able to play sports until I started taking CBD,” Leone said. Leone also said that he had an unexpected customer this summer. A regular customer of his had a German Shepard, Chance, that had a tumor under his eye that was going to be very expensive to remove. According to Leone, Chance’s owners tried using CBD tinctures and THC oils on the tumor externally and internally, and within four months the tumor had shrunk. For people who are looking for an alternative to prescription pain medications but are not interested in the psychotropic effects of marijuana, topical cannabis products may be an option that is worth discussing with a health care professional. I know I have several people in my network who could benefit from a chronic pain solution, so what’s the harm in trying it out?